We are so excited that we will be seeing a lot of you this weekend at the Crazy Quilters' Quilt Show in Port Saint Lucie.. 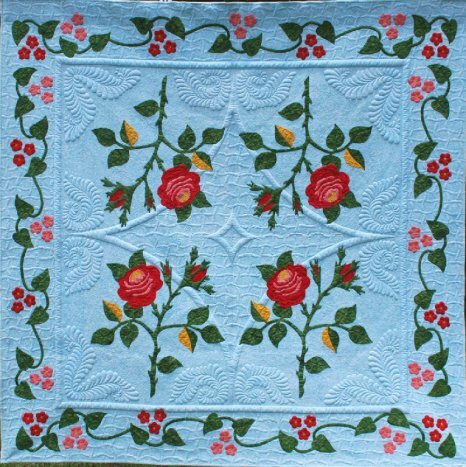 The Show's theme is "Quilting in the Garden" and there are some fabulous quilts for you to view and a nice selection of vendors. Of course, we are a bit prejudice and know the best vendor in the area will be there which is us. We have a booth and will be demonstrating a lot of our favorite things. It is so thrilling to be able to see you-all again. We do miss you but we don't miss the store. Here is link to the show www.pslcrazyquilters.com/QUILT_SHOW.html for all the information on how to get there and all. It begins this Friday at 10am and runs until 5pm and on Saturday it opens at 9am and ends at 4pm and will be over until the next show in 2014. This group under the fine leadership of Felice Gokey and June Keelan have put their hearts and souls into bring this type of Quilting event to the area, so please come and support them. Attend the show, buy a raffle ticket or more, and SHOP Til You Drop You will leave inspired and I bet you will want to go and make something. The Judge was quite inpressed with the quality of workmanship and quilts that were submitted for jurying. You will be as well. Also, please remember to buy a chance on this fantastic raffle quilt that is hand appliqued by a group of fabulous appliquers and quilted by Creative Longarm Quilting, Karen Marchetti. But the most important thing is to come and find us in Booth number 23 and 24. The JaM Patch .com will be on your right hand side as you enter the show. Our booth is full of new kits, gadgets and stuff you will enjoy. We would like to give you a special invitation to visit our booth.....so here it is a coupon to bring with you for $5.00 off your purchase of $25.00 or more. But you must bring the coupon or no redemption. This entitles the presenter with a $5.00 credit toward any purchase of $25.00 or more at the JaM Patch boothduring the PSL Crazy Quilters' Show Februiary 3rd and 4th. Thank you for all the years you visited our store and read our emails. Please present this coupon at the time of purchase and there is no cash value. Everyone at the show will be given a pattern from the JaM Patch valued at $8.00 with their purchase of $15.00 or more. 2. Tote bags - you know you own them....so let's be GREEN and use them. 3. Money, plastic or real! 4. Locate the JaM Patch booth and say hello. 5. Don't forget the JaM Patch coupon. No coupon; no redemption!!! 7. Have fun and bring your creativity and prepared to be wowed!!!! Oh, the rule doesn't apply to winners and there are a few I am sure we all know!!! !